Backpacks and chests are out, battle passes are in. 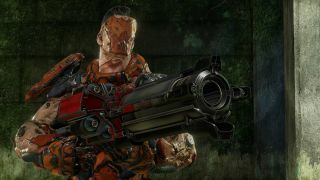 Free-to-play frag 'em up Quake Champions is throwing its convoluted loot box economy in the bin, replacing it with a clearer champion progression system and streamlined economy, along with introducing a Fortnite-style premium battle pass. At the moment, Quake Champions’ rewards system is just a bit of a mess. There are chests, backpacks, shards, runes and definitely too much randomisation. For the most part, that will all be gone with the December update. Replacing this is a free and premium system that lets you focus on unlocking stuff for specific champions. By completing weekly rewards, you’ll unlock shards and XP. Shards can be spent on skins, shaders, vanity items and even new champions. XP, meanwhile, will level up your battle pass—purchased for 1,000 platinum—which will in turn net you even more rewards. Like Fortnite, the battle pass will change as new seasons start, and the first season will last for 3 months. Even if you purchase a battle pass later in the season, you’ll retroactively unlock all the rewards up to and including your current level. It will feature 50 new items and 200 items in total. If you still have any old backpacks, runes, favour, chests and shards when the update arrives, they won’t suddenly vanish. Chests and backpacks won’t have an expiration date and you can open them at any time, old shards will transform into chests and favour will transform into the last of the backpacks. Reliquaries will still appear, but they guarantee a legendary and the duplicate rate will be almost 0. Check out all the changes on the official FAQ. No date has been announced yet, but expect the December update soon.